This is the Caffe Del Sol brought to you by Caffe Vita Coffee Roasting Co. 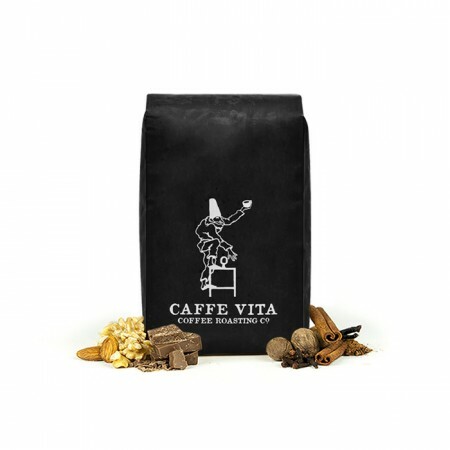 This is Caffe Vita's signature espresso blend and is rich and complex with aromas of dark chocolate, butterscotch and praline. In the cup you'll find a deep, silky, amber crema with a sweet, caramel finish. These guys are right up the street so I've had a decent amount of their stuff. Big fan of this one. Chocolate notes are intense, like hot chocolate. Very sweet and full-bodied with very little acidity. This is an amazing coffee. I really liked the chocolate and caramel notes both on the aroma and taste. Enjoyed it very much. Great pick! I think it's growing on me but it's not what I'm used to and I wasn't a fan at first. But I can drink it black now and I actually do like it. Aromas were accurate but with a fruitier taste, which I understand is a bit of a limitation with Medium beans. I prefer a bit on the bolder side of a medium roast. It has a good roasty, earthy, darker taste to it. Smooth and rich flavor, Definitely agree it has a silky finish. Very much enjoyed this coffee! Really enjoyed this one. It's at its best on a ristretto pull. really liked this coffee, not too many bold fruity flavors,(which i dont like) just smooth! We brewed this espresso as coffee through an aeropress. It was a balanced tasting coffee, though lacked the flavor profile of a typical espresso roast. It was fairly mild, and not all that "roasty." Did not try it as espresso. Deep, dark flavor, but a bit on the muted side. I’m judging very harshly so that I have room to go higher with other coffees. That said, this was, in my inexperienced opinion, very good. The aroma was incredible! However, I think I would like to explore something a bit sweeter, if possible, even if that means a light roast. But I would happily buy this coffee again! I’m still exploring to figure out what I like. This was great - thoroughly enjoyed it straight out of the espresso machine, black, with nothing added. I did end up pulling longer shots with a little more water than usual; I found it to be quite pleasing and wake up the aroma a bit more. Also, this seemed to grind very, very consistently. It only took me 3 tries to dial in to balance grind, volume, and pressure! That’s really good for me, a total beginner. Smooth and caramelly and definitely what we were looking for! Sweet without putting sugar in. I was disappointed to get this brand as I live in Seattle and this is found at all grocery chains here. I'm looking for mistobox to provide something I can't get from any grocery store. I didn't think that the flavor was that complex or very interesting, but since I'm using a la pavoni and quite new, there is quite a bit of variation. I did however notice a burnt bean and an under roasted bean as well as an assortment of misshapen beans. 24grams of coffee for 35-48grams espresso in 30 seconds of extraction. 1-3 ratio steamed milk for a Latte. I was unable to get an extraction that was pleasing to the taste. I found it coffee to be overly bitter with a strong after taste. I prefer a smoother, sweeter chocolate flavor. Liked the roast and the chocolate and butterscotch flavours. I enjoyed this coffee but did not get any of the caramel notes. I think I would like to try a coffee described as fruity, as I always go for coffees with a chocolate descriptor. Enjoyed. Using a Jura nowadays since purchase as opposed to drip/French press. Not sure if it helps with picking from that type of extraction. Looking forward to the Ethiopian I received! A little weak, perhaps not quite dark enough of a roast. Decent flavor. I have only made two lattes so far with this coffee. The first one was very interesting...it had a different flavor, maybe a little nutty like walnuts. I used about 17 grams of coffee and it was about a 27 second shot for 2 ounces. With the second latte I used 18.3 grams of coffee and it was a 31 second 2 ounce shot. This latte was a little smokey and lost its more unique flavor. I will end the next shot sooner. I have a Profitec 600 espresso machine. This expresso machine has the ability to change the brew temperature. Mine is set at 199 degrees right now. Do you have a certain brew profile you recommend with this coffee (grams, temperature, timing)? Overall, I think for my next coffee I would like one that is a little more like milk chocolate than dark chocolate with a sweet carmel note, but not too nutty. This espresso pulled well with a nice crema. I like the flavor description of this one, however, when I used these beans in a latte it didn't really taste like anything. I think the flavors were too subtle to stand up to all the milk in a latte. In our household we drink Americanos and lattes. This coffee worked fine for an Americano but was possibly too mild for a latte. Rich and dark chocolate flavor. Goes well with milk and is fantastic as a mocha. The Caffe del Sol made nice espresso, though the roast was slightly lighter than I prefer. I roast my own to about full city+. Light enough that almost no oils come to the surface after resting. I look for dried fruit, spice, bitter cocoa flavors, I think. Very complex flavor and I could taste the caramel. It was a little too light but overall it was good but not great. At first I wasn't on board with the bean, but I realized I was adding too much water when making it as an Americano. It isn't as bold/in your face as the Stumptown Hairbender, but a much more subtle flavor. It's fantastic as an espresso. Super yummy! I used a stovetop espresso maker to brew. Loved it. Smooth without being too heavy. Tasting notes are about right. One star off because I think I prefer something with a slightly brighter note. Liked this coffee- did have hints of chocolate and some light fruitiness in the finish. I prefer something a bit more nutty but enjoyed this. Brewed well in my espresso machine. Enjoyable taste. I liked the rich, dark taste of this coffee. Smooth with light caramel flavors. Overall good, but it is a little bitter. I use a French Press so I ground the beans to the coarsest setting I could. Then I used approximately a 1:14 coffee/water ratio. I brewed the coffee for 3 minutes. This gave me a relatively strong brew and mostly negated the bitterness that I had been experiencing, but not entirely. With a light amount of cream the bitterness isas taken away and resulted in a great brew. It was a really good coffee. Smelled amazing, tasted great. It was a bit bitter though, it especially gave off a bitter aftertaste. I had ground the beans at the coarsest setting and then experimented a lot with the amount of water used and brew time and still came out a bit too bitter for my taste so I believe as suggested in previous emails, that it might be too strong a coffee for me. I like the deep rich flavor, but the after taste has a sharp high note that is unpleasant to me. Almost bitter, if I could describe it. very smooth. I like it with not much acidity. Excellent blend of espresso. Medium body as described. Very smooth and rich. Solid but not spectacular. Definitely got the chocolate notes, but didn't get much complexity. Very smooth. Great taste. My wife loves it! Very smooth. It had a nice roasted sugar taste to it. I enjoyed the slight dark chocolate taste, but I would have liked a bit more of it. It was a bit light in flavor. It wasn't bad but was not as flavorful as I expected. Lighter roast. Not very strong. Mild flavor. Enjoyed it. Used it for both straight espresso and also cafe au laits which I really enjoy. Was relatively mild and earthy, I thought. Good. Very difficult coffee to work with. Very hard to dial in on a consistent basis. I went back to a coffee I'm very familiar with to see if it was because of weather\humidity swings; but was able to use the know recipe without issue. The coffee was very water soluble which made it difficult to find a proper tamping method and grind setting on a daily basis to prevent channeling while also getting good extraction times. Because of this there I could never find a good recipe to dial the coffee into. As such I wouldn't recommend it. We liked it!!! A little too mild for me tho and caremely. Thats why i only rated it a 4. Cant wait to try the other one!! Very versatile coffee with noticeable differences via pour over or espresso machine. Really loved the rich, chocolate flavor especially via pour over! I tried this in both a French press and espresso machine. Definitely better in the French press. Was smooth and complex. As espresso shot, came out sour and bitter. I thought this blend was okay, perhaps a bit too dark and almost too much of an earthy flavour to it. Still enjoyed it but feel there's some room for new flavours as well. Bold, thick, rich and syrupy. Very nice aroma. I would get this again. Love it. I drank it all in espresso shots/lattes. A few times I thought I had a reasonable extraction time (i.e., not super duper fast) and it tasted a bit more acidic than I would like. The last couple shots I had of it were yummy though, so maybe it/my grinder changed over time? Excellent. Thick and rich but not boring. Really enjoyed it. It was good but again not too interesting. We like the profile but keep going back to the first bag as our favorites. Delicious. Could taste the chocolate. Strong and rich flavor. Definitely enjoyed this one. This coffee is not out there with crazy flavors, and wild tasting notes but rather a very traditional "old man espresso" in the most wonderful of ways. Very easy to dial in my shot, and produced a wonderful classic espresso flavor and aroma. Surprisingly did not like. Used to drink Vicace’s dolce regularly, so tried pulling caffe del sol as ristretto’s 18g in 22g out, but couldn’t ever get the grind dialed in. Great coffee! This was my introduction to specially coffee, and I am definitely impressed! The subtle caramel and sweetness is a wonderful complement. I like it but it tastes a little too earthy to me. I’d love something with less earthiness. I haven't had a chance to make an espresso drink with it yet, but have been enjoying it using a french press. I truly enjoy this coffee. The blend of flavors is excellent and makes for an wonderful start to the day. Loved this one. Perfect flavor and balance. More of this please. Good anytime coffee. Not too strong, not too soft. Low acidity. True to the description. On the darker side, brings out beautiful dark chocolate and sweet caramel. If possible, lower temps (91-93 celsius) really make it shine. Might be my new favorite coffee. Tons of flavor, caramel flavors, appropriately dark. This coffee gave me really bad heartburn every day that I pulled shots from it. I'd like NOT to have Caffe Vita coffee again. I'm sure it's good, but acidic content was too much for me. A little flat for our tastes. Bold and smooth flavor, slightly sweet. Loved this coffee. It has nice strong notes of chocolate and caramel as stated. It's quite sweet and creates great crema. Really enjoyed this! Might just need to order another bag! I’ve loved everything sent so far but this has been my absolute favorite. It’s smooth (yet complex) and just had a fantastic flavor. Has expressed perfectly every time! Good, butterscotch comes through very subtly. When freshly ground, I could really pick up the chocolaty flavor. My wife thought it was good enough to drink without milk and sugar. This coffee was really well balanced and worked well across several brewing methods. Light and smooth on the palate. Flavor was very good. The chocolate and caramel undertones were just the right amount. The coffee, on the whole, was a bit too mild for the complexity. great crema. Like the chocolate and caramel flavor. Had a little bit of a cold so not sure if I was tasting all the flavors. - Good low level of acidity and roast. Didn't taste overly burnt. - Nice smooth and bold texture. - Not too much flavor, though. Might be good to try a lightly flavored coffee that is popular? This is a fantastic classic espresso. Smooth AF, silky finish and not bitter. Best I've had yet. This one was milder and less aromatic than expected. However, this coffee was quite nice as a cappuccino. A gentle milk chocolate. Dark chocolate, carmeley, and rich, this one is pretty good. Not quite perfection, could maybe be nuttier for a more tasty cup. I do enjoy this one though. Tastes like coffee! Rich flavor. We really liked this for espresso milk drinks. This is definitely my favorite of the ones you have sent me. Not sure if I just got lucky with my brewing, but this was a perfect combo of sweet, caramely, with a bit of almost tropical fruit. Really enjoying it as both a shot, and also with milk. Great crema, rich and creamy. Love it. This espresso blend makes the best iced lattes, especially with whole milk. just about the best espresso I've ever had; I wouldn't change a thing about this coffee. I thought this had a very plain flavor. This is my least favorite yet. I've been favoring lighter roasts and this one is dark enough that the oils are starting to appear. This was terrible coffee, especially terrible for Espresso. Might as well buy Starbucks beans, these were everything wrong with most coffee beans. Overroasted, slimy and undrinkable. This was better than the Lucent and had good crema and flavor. I thought the roast was about right and the flavor was more earthy than bright, but less earthy than the Lucent. If I were going to look for any improvement, it would be to retain the sweetness and chocolate notes of the coffee while adding just a touch more fruitiness to make the flavor fuller and more complex.